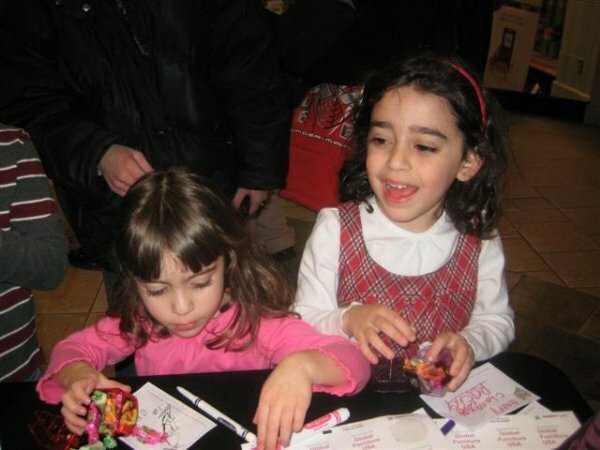 Hundreds of children along with local politicians gathered in celebration of Chanukah and have participated in the packing of personalized large plastic dreidels, which were shipped to United States soldiersin Iraq and Afganistan. 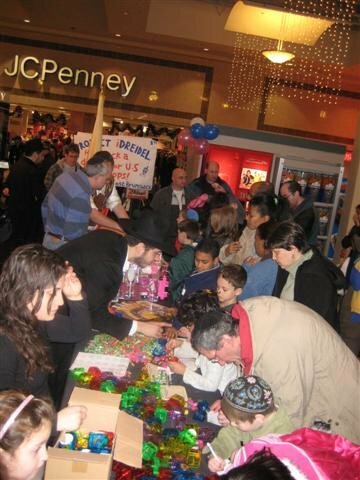 On Saturday, December 8 in The Brunswick Square Mall on route 18, large plastic dreidels were filled with candy and personal letters from children in the East Brunswick area and these packages were shipped for Chanukah to our troops at war. Rabbi Goodman said, "These personalized goodies will lighten up Chanukah for United States troops who our fighting for our country." Mark is young man in Iraq fighting for his country. His family is celebrating the holidays in his absence back at home in Fort Lee, New Jersey. For Mark who is away fighting, like hundreds of soldiers, this Chanukah would be no different than any other day on the calendar except that Mark, along with hundreds of other soldiers, will receive these fun-filled Driedels made just for them. "We know these treats will certainly brighten their day and allow them to embrace Chanukah," Goodman said. This program was co-sponsored by the East Brunswick Chabad Organization and the Brunswick Square Mall, was an exciting and fun event for the whole family.